United by Glue: Pat your machine! 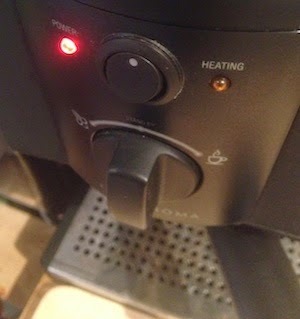 I have a coffee machine that sits there and makes coffee. That is its job. I don't pay it. I pat it. But coffee machines, like dogs, cannot live on pats alone. You also need to plug them in. The coffee machine, not the dogs. Do not plug your dog in. Unless it is a metaphorical plugging in, and you're actually taking them to socialise. Plugging them into the puppy social scene, so to speak. You can do that. It is good for them. Electricity is not. If you didn't already know this, you should find a new owner for your dog. Love is no substitute for basic household safety. No! No, it isn't. The coffee machine used to be Steve and Selena's, but they put it in a cupboard for some reason, and then later offered it to me, which I subsequently accepted, which turned out really well for me, because I like coffee, so I drink a lot of it, and it really cuts down the amount of walking and paying that I do, and it is a little machine, and I like little machines, so it has a lot of positive aspects, which I feel we all need in our lives, because they're positive, and positive is better than negative, which goes without saying, but I said it anyway, because sometimes we need to be reminded of these things, and we have word counts we have committed to, but I digress. If I were a Transformer, this would be my grumpy face. Probably the best thing about the coffee machine is that it is just over there. Do you see where I'm pointing? There! See on the Ikea kitchen bench thing on wheels? Near the microwave. It is super close. It is two regular step and one big step away from where I am right now. The big step is to get over the pile of washing, which is on the floor. If you are wondering whether it is the same pile of washing, it probably is. It's like a hotel for clothes made of clothes. It is a sort of meta hotel. It only exists because it has guests. Without guests it is just an empty space. Some items come and go, only there for short stays, but there are shirts in there that remember when we served horse meat during the war. I particularly enjoy making my own coffees, because it gives me a sense of accomplishment. I made something today. Well, I made seven somethings. They were all flat whites. Plus it has a knob, and a switch, and this thing that needs filling with water, and then the coffee handle bit locks into place and it is basically a big lever, so it is pretty much as close as I am going to come to being an astronaut. Man, I need a space helmet. Take your coffee beans, and put your helmet on! I guess what I'm saying is that I like coffee, and pretending to be an astronaut, and David Bowie.